I spy with my little eye... a coffee with designer Sahar Wahbeh. 'Tis the season to be jolly... and think about presents. I couldn't talk about Christmas and children without talking about the sweet and talented Sahar Wahbeh. 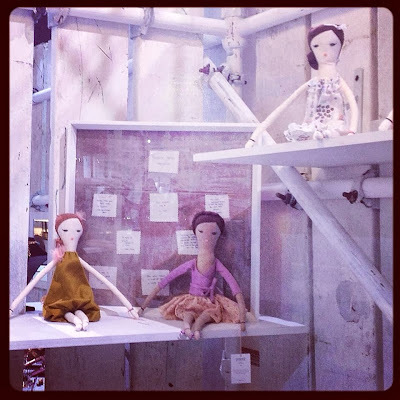 The first time I heard about Dumye dolls, I remember loving their home-made look: they are global, timeless, environmental friendly and stylish. Then I read about them and the one thing that makes them so special is not their look but the concept behind them: for every doll purchased, a doll is offered to an orphan. How sweet and special is that? I remember thinking I'd love to give more exposure to that great initiative, so when I bumped into Sahar at Fashion Forward, I took the opportunity to learn a little bit more about her and her project. She is sweet, thoughtful and such a hard-worker I loved her instantly. She started making dolls for her daughter, hasn't stopped since, and is currently counting her dolls, making sure enough have been sold to donate one to every children of the next orphanage she'll be working with (it wouldn't be fair to give a doll to half of the children only so she needs to have enough for all of them). So if you have children, or are planning to play Santa to your nephews, nieces etc... Have a look at Dumye dolls, they are lovely and will definitively make more than one child's day. And to learn a little bit more about Sahar, keep on reading! S.W. : Edgar Degas – “The Rehearsal’ These girls spend their days in a beautiful room, filled with natural light, amongst friends, doing what they love the most and all to the rhythm of live classical music. Heavenly. S.W. : I think we are lucky to be alive in this era. Although the world is full of strife there is an incredible amount of hope in the advances we have made. Instead of longing for the past I feel my energy is better placed looking forward and shaping a better future so that we can leave our children to world better then the one we were born to. S.W. : I have this beautiful turquoise shawl my mother crocheted when she was in her 20’s. Every time I wear it, I can’t help but think of her and imagine all the adventures they must have shared. S.W. : Hands down - The smell of a Strawberry Shortcake doll. S.W. : When I am on a warm beach with those I love the most. It is those times that I feel the most relaxed and 100% present in the moment. S.W. : Oh my I don’t know… I guess I would have to say Oscar de la Renta. He knows how to make a women feel feminine, even if she were to be riding a camel. S.W. : Nothing beats home made guacamole. I never tire of it. S.W. : My dad always says “If there is a will, there is a way”. This his definitely stuck with me in life. S.W. : The Book of Daniel by E.L. Doctorow. I don’t know if it was the book or the incredible teacher that lead our class through it. Either way it changed my perspective on the world in a major way. It taught me that there is no one truth. The line between right and wrong became so grey and everything I had learned up to this point in my life was questioned and scrutinized. HOB: Your three favourite spots in Dubai? S.W. : 1- Safa Park – no better place to enjoy a carefree family afternoon. 2- Comptoir 201 - for yummy clean food & an inspiring ambience. 3- Amara Spa in the Park Hyatt – the best treat any girl or guy could ask for.